Ma’alot Ready to Be Kerem! Welcome to our last entry in the Ma’alot 2015 blog!! We are so sad that soon we must give you back your children because we have had the most incredible summer with them! 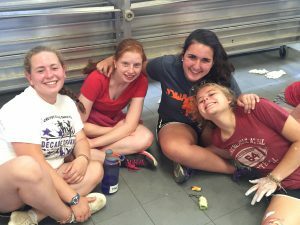 For our last Shabbat, everyone in the aydah (unit) received a Shabbat-O-Gram from someone else in the aydah, just as we’ve been doing every Shabbat this summer. Our tisch on Friday night was especially beautiful when people spoke about memories they will take home with them from the summer. 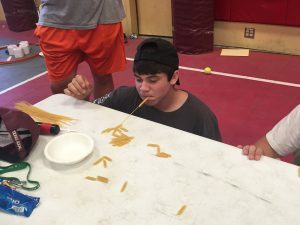 On Sunday, we continued with Maccabiah (color war) as everyone did a sports round robin, a minute to win it activity, and a night of Dizzy Izzies. We have also finished our chesed (acts of loving kindness) project of painting the fence near the girls’ area and the chanichim (campers) did such an amazing job – it looks beautiful!!! With the summer almost over, we want to thank you for letting us share it with you. It was truly the best summer, and it was amazing for us to see how much the chanichim grew individually and together as an aydah that will be the next leaders of the camp in KEREM ’16!!!!!!! !